Shout Out from Inspiring City! Just about to start the "Reflection Connection" on Selva de Mar, along came Stuart, a London blogger who was sponsored to come to Barcelona and write about the street art scene. In the few days he had been here, he already developed a network of artists (it's easy, since everyone is very eager to introduce you to someone who may be helpful). We chatted for a bit and he interviewed me after I explained this was my first "real" street art abroad, where I had a sketch and paints of my own. 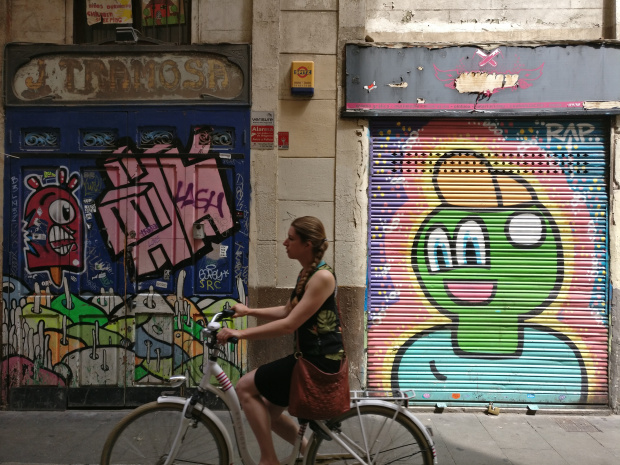 If you want to learn more about the scene here in Barcelona, he met all the heavy hitters in the area and wrote about them (and me), along with a few of my new-found friends.